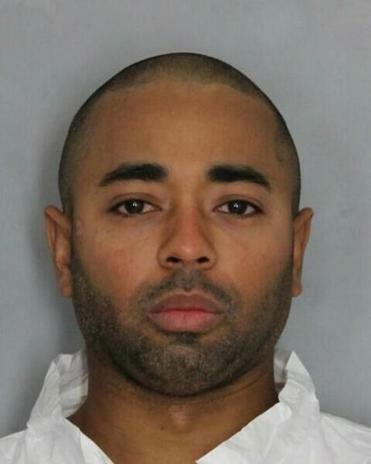 Louis D. Coleman III, the man who allegedly abducted Jassy Correia on Feb. 24 after she left a Boston nightclub, had her body, along with a cutting tool and pliers, inside his vehicle when Delaware troopers caught him four days later, court records show. The grisly details were disclosed in an affidavit filed Sunday in federal court in Boston, where Coleman, 32, is charged with kidnapping resulting in death, a felony count that could potentially bring the death penalty. 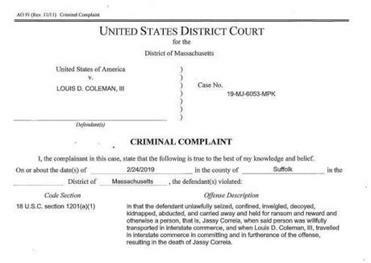 On Monday, Coleman appeared in a federal courtroom in Delaware, where he waived his right to detention and preliminary hearings in that state, clearing the way for him to be returned to Massachusetts, prosecutors said. He will be transferred to Boston at an undetermined date, authorities said. Edson A. Bostic, the federal public defender who represented Coleman in Delaware, declined to comment. A court filing said Coleman is seeking a court-appointed lawyer. Warning: Content in this material may be explicit. Inside the trunk, a suitcase contained the body of Correia, 23, who had “significant bruising and blood about her face, was bound with gray duct tape and had a white powdery residue over her body, believed to be baking soda,” the affidavit stated. Andrew E. Lelling, the US Attorney for Massachusetts, said Sunday that authorities have “probable cause” to believe Coleman killed Correia, who appears to have died from strangulation and blunt force trauma. Police also recovered a new long-handled garden cutting tool and a new pair of pliers from Coleman’s car, according to the affidavit. Court papers laid out a timeline of Correia’s movements after she left Venu, a nightclub in Boston’s Theater District, early on Sunday, Feb. 24. Video surveillance showed that Correia “interacted with several people” around 2:14 a.m. on Tremont Street. Coleman approached her about two minutes later and began talking with her, the affidavit stated. Footage shows Correia and Coleman walking together and getting into Coleman’s car, according to legal filings. Footage from Coleman’s apartment complex in Providence showed him pulling into the parking lot around 4:15 a.m. He got out of his car and returned carrying a blanket, the affidavit stated. He then carried Correia into the apartment building, placing her on the floor and dragging her to an elevator. She was naked from the waist up, according to the affidavit. She was not moving and her body was limp. On Feb. 26, the same day Correia’s father reported her missing, Coleman went to a Walgreens in Providence and bought three Tyvek suits, duct tape, two candles, electrical tape, a mask, surgical gloves, two pairs of safety goggles, an odor respirator, and CLN Release Bleach Bath, the filing said. Shortly before 10 p.m. on Feb. 27, Coleman entered his apartment with a large suitcase with bright blue piping. The suitcase appeared new, with its sales tags still on, the affidavit stated. At 1:15 a.m., he wheeled the suitcase out of his building and lifted it, with some difficulty, into the trunk of his car, the affidavit stated. When he was apprehended later that afternoon in Delaware, his windshield was cracked in two spots on the passenger side. Lelling said Sunday that Correia, the mother of a 2-year-old girl, appeared to have put up a fight. During booking in Delaware, a trooper noted a large bandage on Coleman’s face and asked about his injury, records show. “Coleman responded, in substance, ‘It’s from the girl,’ ” according to the affidavit. Correia’s family has described her as a loving mother to her daughter, Gabriella, with dreams of pursuing a career as a party planner. “I wanted everybody to know Jassy might be gone but, she will never be forgotten!” Wynn wrote in an e-mail. Evan Allen of the Globe staff and Globe correspondents Jeremy C. Fox, Maddie Kilgannon, and John Hilliard contributed to this report.